A sample of lepidolite from Brazil. Once thought of as a single mineral species, lepidolite has been recently redefined as a series of minerals in the mica group. Chemically, it may be referred to as potassium lithium aluminum silicate hydroxide fluoride. Its lithium content can vary, but the lithium-rich varieties form an important source of this element and are generally associated with other lithium-bearing minerals (such as spodumene) in pegmatite bodies. It is also one of the main sources of the rare alkali metals, rubidium and cesium. Lepidolite is often found associated with other minerals, such as spodumene, quartz, amblygonite, feldspar, and tourmaline. Noteworthy deposits have been found in Brazil; Ural Mountains, Russia; California; and Tanco Pegmatite at Bernic Lake in Manitoba, Canada. The chemical formula of lepidolite may be written as KLi2Al(Al,Si)3O10(F,OH)2. It has a vitreous to pearly luster and ranges from transparent to translucent. Typically, its colors range from lilac to pale pink to white, but gray and yellow varieties have also been found occasionally. It has a hardness of about 2.5 on the Mohs scale, while its density is generally between 2.8 and 2.9, and its streak is white. 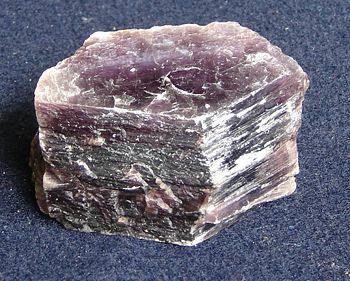 Like other micas, lepidolite is composed of layered sheets and is often found as large plates or "books." It may also be found in the form of granular masses. The sheets consist of lithium aluminum silicate and are held together by potassium ions. The crystal structure of lepidolite belongs to the monoclinic system, and the crystal habit may be tabular or prismatic. The cleavage is perfect in one direction, producing flakes. Lithium-rich lepidolite is a major source of the element lithium, which in turn has many applications. For instance, lithium is used in rechargeable batteries, alloys for aircraft parts, and appliances like toasters and microwave ovens. Lithium compounds are used in mobile phones, air purifiers, high-temperature lubricants, and mood-stabilizing drugs. In addition, lepidolite varieties that are enriched in rubidium or cesium serve as important sources for these rare alkali metals. ↑ Lepidolite, Mindat.org. Retrieved May 11, 2007. ↑ H. Nechamkin, The Chemistry of the Elements, New York: McGraw-Hill, 1968. Deer, W.A., R.A. Howie, and J. Zussman. 1996. An Introduction to the Rock-Forming Minerals. 2nd ed. Upper Saddle River, NJ: Prentice Hall. ISBN 0582300940. Mineral Gallery. 2006. The Mineral Lepidolite. Amethyst Galleries. Retrieved May 11, 2007.